Apologies for the poor quality of the photo, taken by me 2nd August 2016, the lighting spoils it. 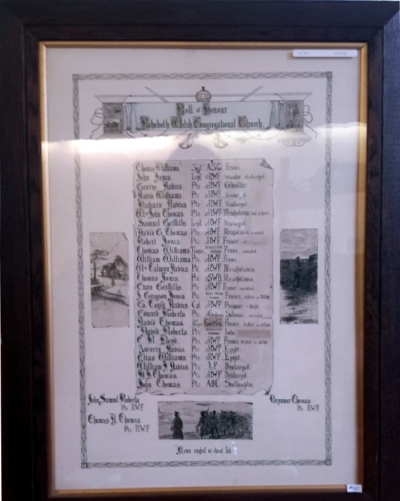 I found out about this Roll of Honour whilst looking in the Imperial Museum Memorial Project Website – http://www.iwm.org.uk/memorials/item/memorial/49730, it is described as a large framed and glazed Roll of Honour, illuminated with drawings and hand written, it is held in the Flintshire Record Office, Hawarden, Ref:-N/94/1. The names are of the men from the church who were in the war, of them 4 died, 3 of whom are on the Connah’s Quay & Shotton War Memorial, the other 1, E.R. LLOYD is, as far as I know, not on any other War Memorial, so at least he has been found and his name is remembered, but sadly I know nothing about him, if anyone knows who he might be, please get in touch and lets bring his story to the fore. John Samuel ROBERTS, Pte, R.W.F. Brynmor THOMAS, Pte., R.W.F. Also Bottom-left Thomas D. THOMAS, Pte.,R.W.F.